Winter weather cooking is all about comfort foods that are full of flavor and warmth. Lately I have been playing around with braising cheap cuts of meat. The flavors are incredible, the meat is insanely tender, and braising is really very easy to do. Technically braising is just searing then slow cooking a cut of meat that has a tough quality or connective tissue that needs broken down. 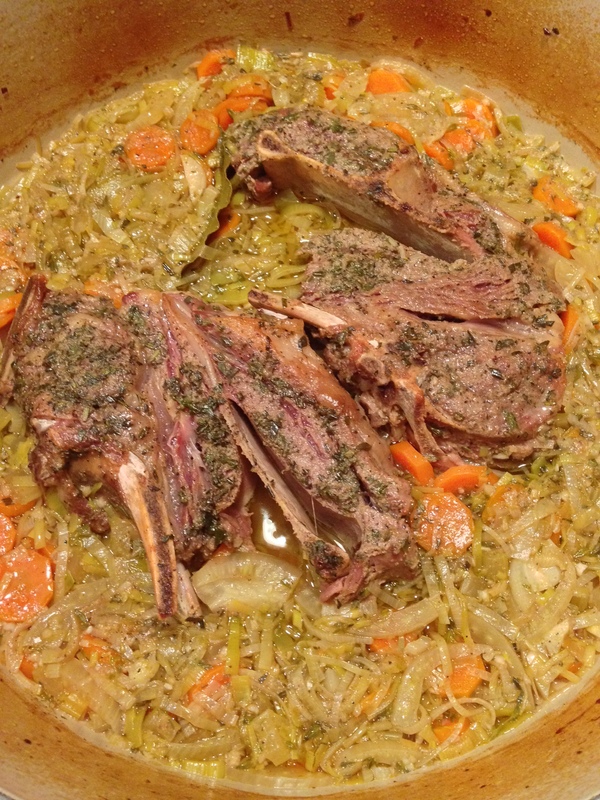 Adding wine, beer, or tomatoes with broth then covering to finish cooking for a long period of time completes the braising process. Of course time is a factor and planning in advance will only help enhance the flavors, try this for a fancy weekend meal. 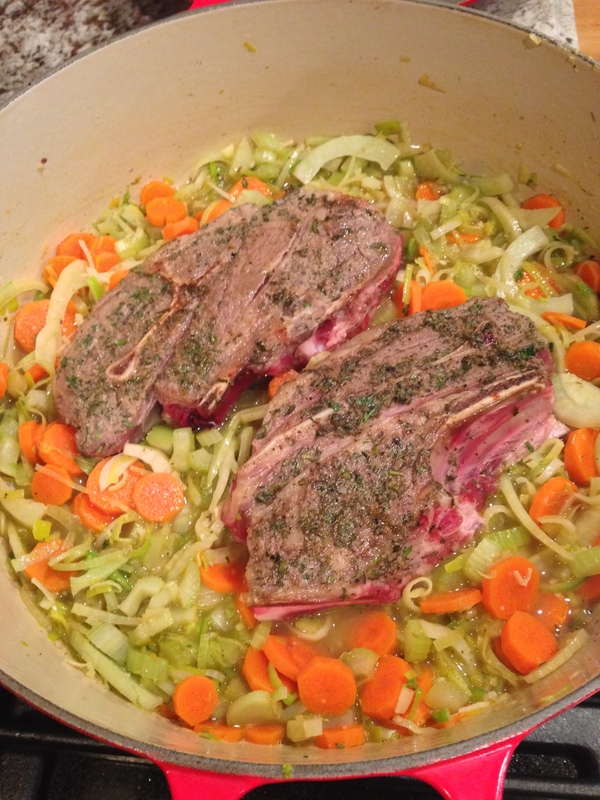 For tonights braising I got the lamb chops at Paulina Meat Market and decided to go with a white wine and beef broth cooking liquid, fresh herbs, and vegetables to enhance the lamb. 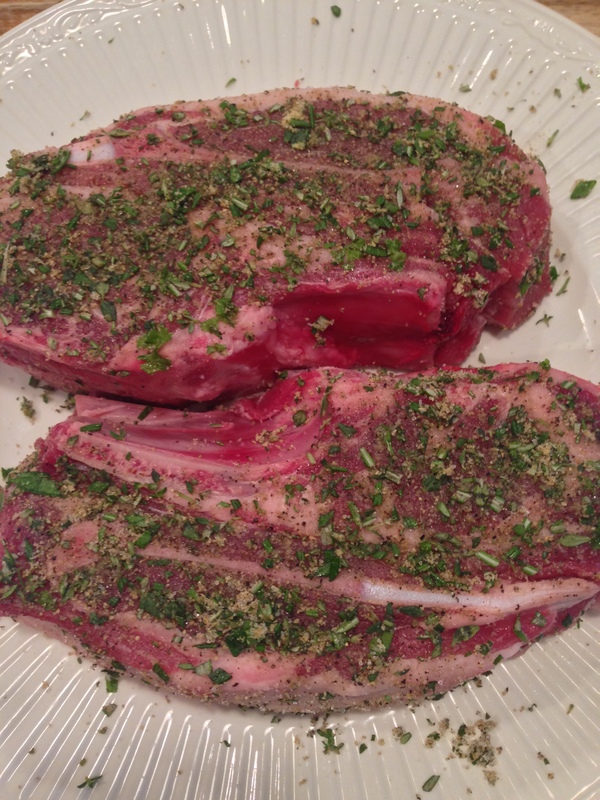 I chose lamb shoulder chops that are blade cut, the least expensive cut of lamb in stock at the market. I decided to keep the flavors soft using leeks instead of onions with the white wine. Starting on Saturday I rubbed the lamb down giving it a day to soak in, I definitely recommend this with this recipe. Thyme goes so nicely with dry white wine and I happen to have a lot growing right now, so I used that primarily with a little fresh rosemary and parsley to round out the flavors. You can use other herbs that you have fresh or dried (use a little less if using dried herbs as they are more potent) sage or oregano would be lovely as well. 1. 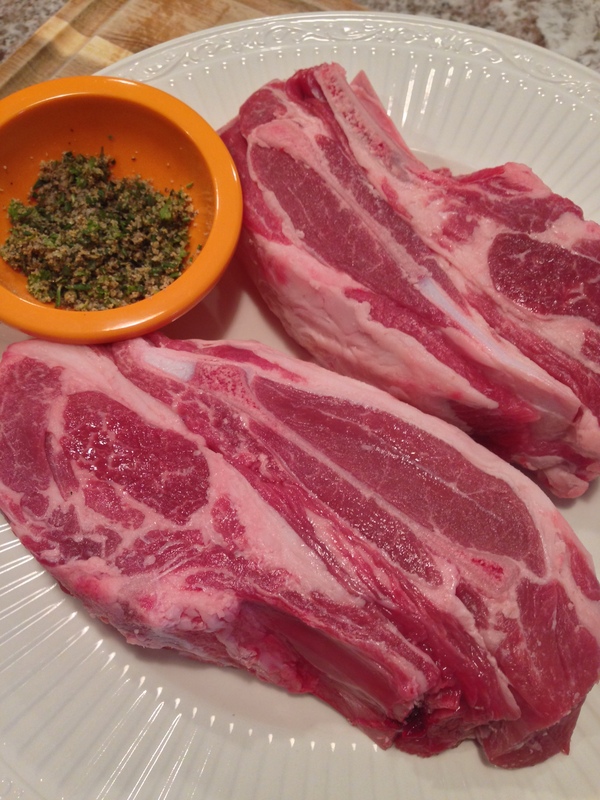 At least one hour in advance (up to 12 hours in advance) mix together rub ingredients and pat onto lamb chops, refrigerate until 30 minutes before browning. 2. Choose a large heavy pan with an oven-safe lid to make the meal in. 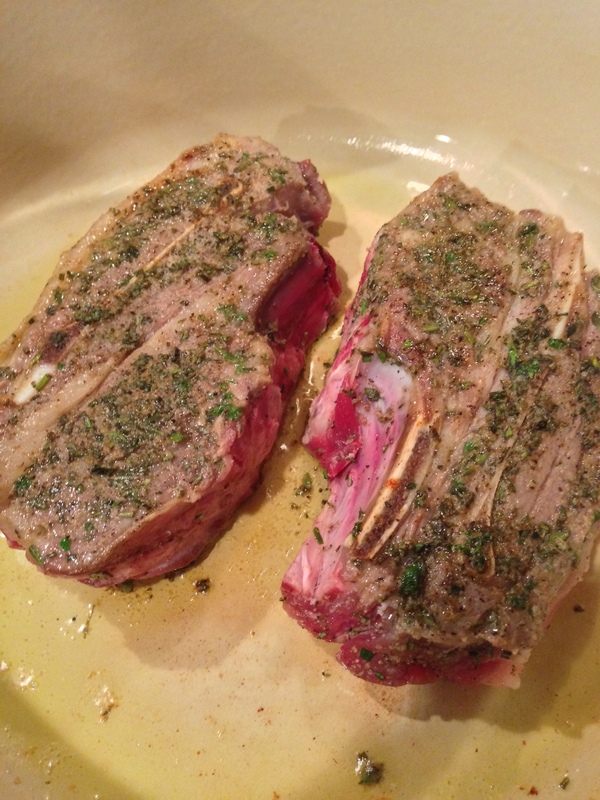 Heat on medium-high, coat with olive oil and brown lamb chops 5 minutes on each side. Remove from pan and set aside. 3. Lower heat to medium-low, add a pad of butter to pan and saute carrots, celery, fennel, garlic, thyme, and bay leaves. Saute for 8-10 minutes before adding white wine, beef broth, and chops to pan. The liquid should come about 2/3 of the way up the side of the meat, I added a little more wine and broth after taking this picture below. Bring to a boil. 4. Once boiling, cover pan and place in oven at 285 degrees for 3 hours. In the end the meat is literally falling off the bone and that tough connective tissue has melted into a soft smooth consistency. The smell is incredible and the taste is so flavorful, words cannot do justice. To serve this I boiled some cauliflower until very tender, mixed it in the kitchenaid standing mixer with butter, roasted garlic, salt, pepper, and a little milk. 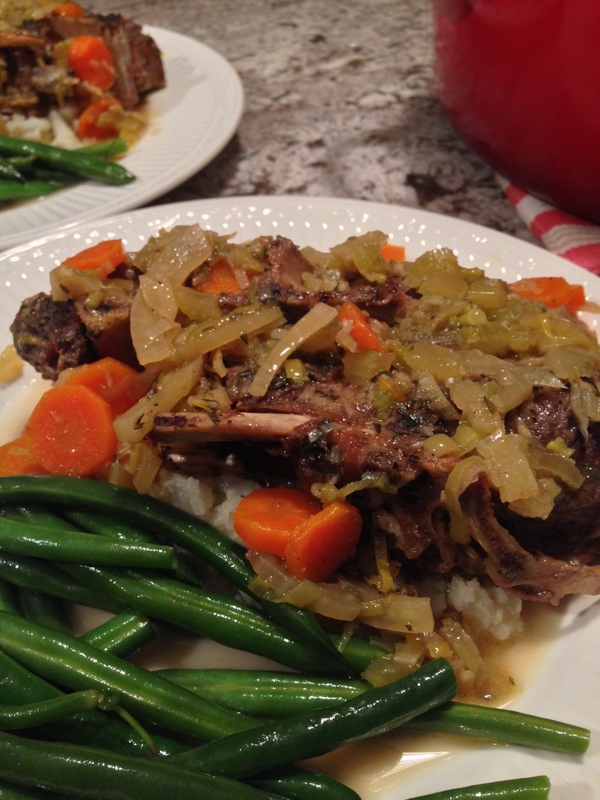 It made a rice-like consistency that was a perfect bed for the lamb and vegetables. You can also use rice or mashed potatoes, but I wanted to make this paleo friendly. Fresh green beans for a side and you have yourself a restaurant quality meal at home.